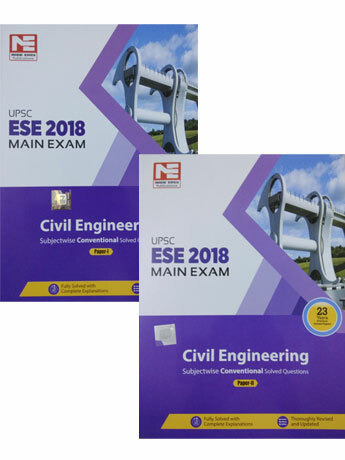 Save money and get ESE Civil Engineering 2018 Mains Conventional Paper I and II, a bundle of 2 books. This edition of ESE Civil Engineering Conventional book is arranged as per the requirements of the latest syllabi of ESE. Every chapter in the book is logically divided into various sections, while ensuring that the contents in the book are self-sufficient and require no cross-referencing. All conventional questions along with their solutions are given in each chapter. The book offers a unique problem-solving technique, which guides students towards stepwise solving of problems. Efforts have been made to avoid any kind of misconception and complexity in understanding the solutions of the problems. Overall, the whole content of the book furnishes the students with the right knowledge and paves a confident path for the aspirants to accomplish success in ESE.